Plants: they’re good for more than just growing food, flowers, and fuel. A futuristic-sounding company called Applied DNA Sciences recently signed a deal with an as-yet-unnamed luxury goods company to use unique plant DNA to track products to individual customers. Applied DNA Sciences’ technology uses the complex codes embedded in plant DNA to track counterfeited products. 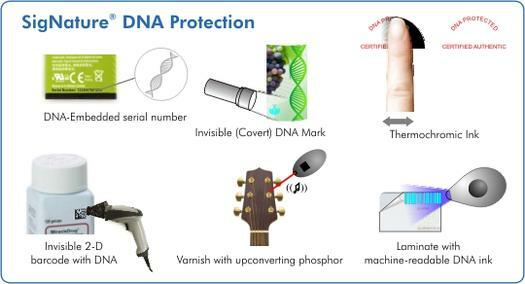 The company’s DNA-marked security inks can be placed in inkjet, toner, varnishes, and textile treatments for easy tracking. Such a specialized service isn’t cheap–Applied DNA Sciences won’t disclose exactly how much the luxury goods company is paying, but the company does charge for each authentication mark purchased as well as for authentication of potential counterfeits. The plant DNA-tracking system has already been used by the U.K. police with great success. Applied Sciences’ technology caught a pair of criminals attempting to hold up a cash delivery van with help from DNA markers present in the cash boxes. The cops caught the criminals using a handheld scanner that identified the markers. We’re guessing that the counterfeit technology is still far too expensive for mass use, but one day criminals could even be prevented from walking out of the local drugstore with unpaid goods–no more faulty security systems necessary.